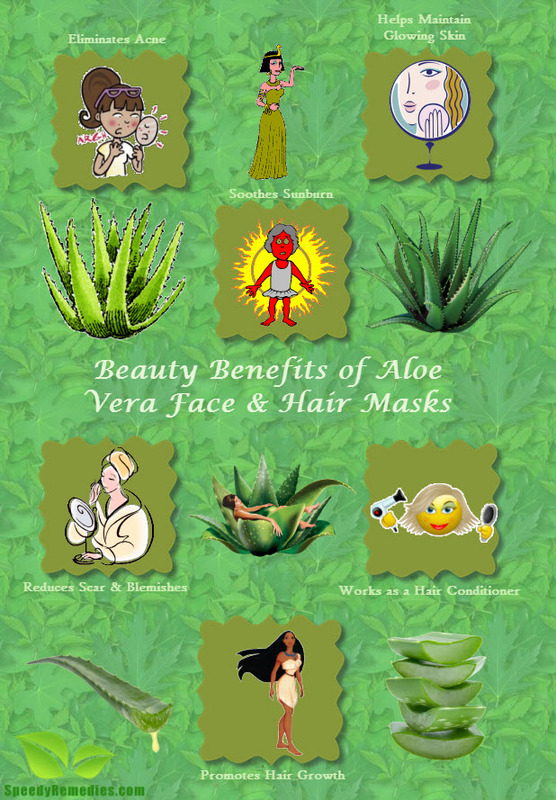 Aloe vera face masks benefit in dealing with a number of beauty problems like acne, sunburn, freckles, rashes, dry skin, mild burns, wounds, cold sores, stretch marks, and so on. Furthermore, they help you maintain healthy and glowing skin. Thus, it is included in a number of cosmetic products. It is believed that Egyptian queen Cleaopatra also used this beauty secret extensively to pamper her skin. Basically, aloe vera is a type of cactus plant that grows in dry climates. The long, succulent leaves of the plant contain a translucent sap which is referred to as aloe vera gel. The simplest way to apply use aloe vera gel for skin is to apply pure aloe vera gel as a face mask. You need not wipe it off until it dries on the skin. The gel is packed with vitamins, minerals, essential fatty acids, and antioxidants. It contains vitamin A, vitamin B12, vitamin C, vitamin E, folic acid, choline, calcium, magnesium, manganese, selenium, zinc, etc. Furthermore, it provides seven of the eight essential amino acids and almost 20 of the 22 amino acids required by the human body. Its flavonoids, in particular, fight free radical damage and reduce the signs of aging. In addition, it improves collagen production by stimulating fibroblast cells that stimulate the production of collagen. Moreover, it has anti-inflammatory, antiseptic, analgesic, antibacterial, and antifungal properties. It is good for those with sensitive skin, too. In fact, allergies to this medicinal plant are extremely rare. Application of aloe vera gel relieves the itching and stinging sensation caused by insect bites. Plus, it can help reduce tissue damage caused by frostbite. Furthermore, it is useful in soothing rosacea, eczema, psoriasis, warts, athlete’s foot, allergic reactions, abrasions, and so on. Apart from the skin, it is excellent for your hair, too. For instance, it stimulates hair growth and cures dandruff. It has certain enzymes that help add volume to your hair. It has alkaline properties the help maintain the pH of the hair and scalp. Besides, it can be used to heal a number of internal disorders like ulcers, irritable bowel syndrome, constipation, heartburn, high blood pressure, high blood cholesterol, anemia, joint pain, and so on. In addition, it strengthens the tooth enamel, boosts the immune system, fights cancer, and aids in detoxification. Interestingly, consuming about four ounces aloe vera gel daily helps reduce excess weight. Beauty Mask for Acne: Whisk an egg white and add one tablespoon of green tea, four tablespoons of aloe vera gel, and two drops of chamomile essential oil in it. Leave this mask on your skin for 15-20 minutes before rinsing it off. Another easy recipe involves using a combination of two tablespoons of aloe vera gel and one teaspoon of tea tree oil. Sunburn and Freckles: Mix six tablespoons of cucumber juice, four tablespoons of aloe vera gel, and two tablespoons of plain yogurt. Leave this mask on your face and neck for 15-20 minutes. Besides, you may use a combination of aloe vera gel and lemon juice. Scars and Blemishes: Prepare a paste by adding sufficient rose water in aloe vera gel. Apply it on your face and neck. After 20 minutes, rinse it off with cold water. To reduce dark spots, you can mix a teaspoon of olive oil and a few drops of lemon juice in two tablespoons of aloe vera gel. Apply it on your face and wash it off with warm water after 15 minutes. Wrinkles: Beat an egg yolk and add one teaspoon each of aloe vera juice and olive oil in it. Apply this anti-wrinkle and anti aging face mask with the help of a cotton ball. Rinse it off after 15-20 minutes. Dry Skin: To rejuvenate dry skin, you can prepare a facial mask by mixing three tablespoons of aloe vera gel and one tablespoons of rose oil. Smear this mask evenly on your skin and rinse it off with lukewarm water after 10 minutes. Alternatively, you may use a combination of two teaspoons of aloe vera, and one teaspoon each of rose water and almond oil. Furthermore, you can apply a combination of one teaspoon of aloe vera gel and two tablespoons of honey on a daily basis. Cleansing Mask for Clear Skin: Put a slice of a ripe papaya, aloe vera gel scooped out from an aloe leaf, and one tablespoon of honey, and a teaspoon of yogurt in a blender or food processor. Turn it on to blend the ingredients. Spread the resultant mask on your face and neck. After 15 minutes, wash it off with lukewarm water. Aloe Vera Mask for Glowing Skin: Mix one teaspoon each of raw milk, honey, a pinch of turmeric, and a few drops of rose water in aloe vera gel. Apply this paste on your skin and wash it off after 20 minutes. You can also add two tablespoons of aloe vera gel in an exfoliating mask prepared by mixing two teaspoon of brown sugar and one teaspoon of lemon juice. Aloe Vera Fruit Mask: Pamper your skin with a nourishing aloe fruit mask. The recipe involves blending a few pieces of your favorite fruit like banana, avocado, orange, kiwifruit, etc., along with a teaspoon of aloe vera gel. In case you have dry skin, you may add a teaspoon of almond oil as well. Hair Pack for Dandruff: Applying a mixture of aloe vera gel and a few drops of tea tree oil is excellent for reducing dandruff. You may add a little rose water, too. Leave it on your hair for about an hour or so before washing your hair. Follow this procedure once or twice weekly. Hair Growth: Add a quarter cup of wheat germ oil and half a cup of coconut milk in half a cup of aloe vera gel. Massage it on your hair and scalp. Wash your hair after at least half an hour. Soft, Shiny Hair: To get soft, shiny hair, mix three teaspoons of aloe vera gel and one teaspoon each of lemon juice and coconut oil. Massage this mixture on your hair and scalp. Finally, shampoo your hair after 20 minutes. Aloe Vera Mask as Hair Conditioner: You can use aloe vera gel as a hair conditioner to get smooth, silky hair and help detangle your tresses. For this, you need to blend aloe vera gel taken from two to three large aloe leaves in a blender. Alternatively, you may mix four ounces each of aloe vera gel and water, and about 10 drops of an essential oil of your choice. Massage the resultant jelly on your hair after washing them. Rinse it off after five minutes. You may also add it in your regular conditioner and then use. You can add aloe vera gel in any beauty mask to help moisturize the skin. Besides, you can apply a thin layer of aloe vera gel on your skin before applying make-up to avoid dryness. Men can also apply aloe vera gel on the face as a natural aftershave to soften the skin and soothe razor burns. Apart from applying aloe vera gel for its beauty benefits, you can also drink aloe vera juice as a tonic for overall health.